The early and late show from April 10, 1970 of the Doors' final tour with Jim Morrison is presented here in three discs. An epic and incendiary booze-filled musical journey through the Doors' biggest hits, greatest tracks, inspired covers, and assorted spoken word gems, almost all previously unreleased, is the highlight for any superfan. 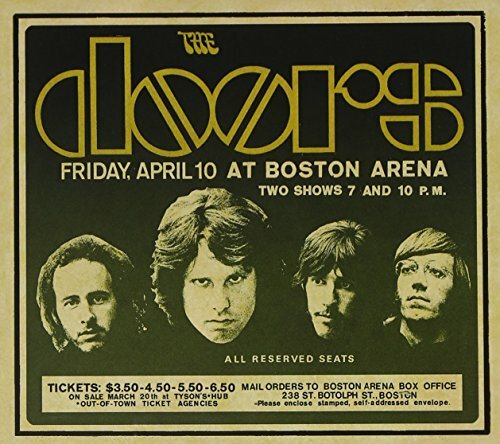 The three discs capture their 1970 tours' legendary first stop at the Boston Arena on April 10, 1970 with complete recordings of both the early & late shows; CD 1 presents the early show including 'Roadhouse Blues' and mind-bending renditions of 'Alabama Song [Whisky Bar]', 'When The Music's Over', 'Light My Fire' and more plus CD's 2 + 3 which unleashes the sprawling second show featuring the highlights 'Break On Through', 'Back Door Man' and Morrison's spoken word riff through 'Adolf Hitler', presented in a fold-out digipak. Rhino. 2007.